Two nights ago, while sitting at the table in front of my large picture window, a large moth came to visit the glow. For an hour it fluttered about, beating its wings against the glass. The following morning I was pleased to see it perched on the window frame. I gently blew on it. It spread its wings, displaying a soft brown with pink and black tracing the wing edges, twin eye-like areas of yellow trimmed in black eyelash held silver circles, while the upper wing section of the 5”x 2” moth had similar patterns and colors… Antheraea Polyphemus, as broad as my outstretched hand. Polyphemus have no mouths. They will lay their eggs and die. Assuming it was in the dying stage, I placed it on a paper next to me on the deck table so it would have a companion—anthropomorphizing?…having several friends die recently…best not to die alone. I would touch it, blow on it; the only response was for it to slowly spread its wings. When a bird appeared on the table, I moved it inside. When it died I would add it to my box of butterflies, moths, and dragonflies that I found whole after their life force departed. That night I heard a commotion. I discovered Polyphemus slamming wildly against a wall. I captured it under a glass bowl where it continued to flutter violently. I weighed whether to add the moth to my collection or to free it to fully experience however many hours it had left. I took it outside. When I removed the bowl cover, it instantly took flight, wildly zigzagging as it rose up into the sky. Its embrace of the night was mine as well. 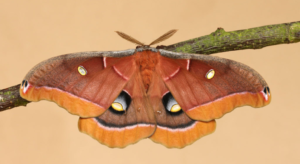 As Polyphemus ascended, it passed directly in front of Mars, which was particularly red and robust—being closer to earth now than it will be for 60K years—then the moth with great expression crossed the horizon disappearing behind the tree tops.